YEE HA! Grab your cowboy hat and hop on your horse as you prepare for some Wild West fun with Whiskey Barrels Slots. Hopefully you might even be riding off into the sunset with the jackpot of 2,500 coins. Whiskey Barrels is a 3 Reel Slots, 1 pay line video slot game that is set in the dusty and exciting times of gun slinging cowboys, when whiskey was stored in barrels rather than bottles. As a game, Whiskey barrels, is incredibly easy and enjoyable to play, with its simple yet colourful graphics and it’s no nonsense theme tune. This slot game is ideal for beginners who want to master the art of slot gaming, but it can easily be enjoyed by experienced players because it is a game of chance. Whiskey Barrels Slots uses a treasure slot theme or a pirate slot theme. Before you reach for your boots and spurs, remember that Whiskey Barrels is a 3 reel slot game, and therefore you can bet anywhere from one to three coins in any denomination which ranges from 50 cent to $10. In order to maximise the chances of winning the jackpot you should aim to bet the maximum of 3 coins. 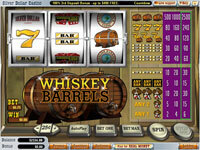 The Whiskey Barrels slot game is very similar to other traditional 3 reel slot games, in that there is always one symbol that is a non paying symbol. What sets this slot game apart from most of the classics is that certain symbols will require only one to be displayed in order to offer a small pay out, which double the chances of an overall winning total. The symbols that appear in Whiskey Barrels slot game are cleverly associated to theme of the game. The symbols include a cowboy, which will payout if only one or two are displayed, a yellow seven, a one bar, a two bar, a three bar, and the jackpot symbol which is a whiskey barrel. The casino logo is the non paying symbol no matter how many are matched or how much is bet. Head on down to the old saloon in order to the play Whiskey Barrels slot game. This game is available at Liberty Slots online casino will try to entice you with there introductory bonuses. Liberty Slots is an established casino which welcomes all lone cowboys from the US and many other countries. At Liberty Slots you will also receive an impressive 100% match bonus for the first deposit, and you will have the opportunity to join their reward scheme which will add more bonuses and rewards as you climb up the tiers.